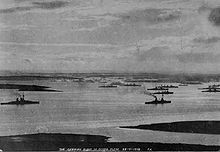 The scuttling of the German fleet took place at the Royal Navy's base at Scapa Flow, in Scotland, after the First World War. The High Seas Fleet was interned there under the terms of the Armistice whilst negotiations took place over the fate of the ships. Fearing that all of the ships would be seized and divided amongst the allied powers Admiral Ludwig von Reuter decided to scuttle the fleet. The scuttling was carried out on 21 June 1919. Intervening British guard ships were able to beach a number of the ships, but 52 of the 74 interned vessels sank. Many of the wrecks were salvaged over the next two decades and were towed away for scrapping. Those that remain are popular diving sites. The signing of the Armistice on 11 November 1918, at Compiègne, France, effectively ended the First World War. The Allied powers agreed that Germany's U-boat fleet should be surrendered without the possibility of return, but were unable to agree upon a course of action regarding the German surface fleet. The Americans suggested that the ships be interned in a neutral port until a final decision was reached, but the two countries that were approached – Norway and Spain – both refused. Admiral Rosslyn Wemyss suggested that the fleet be interned at Scapa Flow with a skeleton crew of German sailors, and guarded in the interim by the Grand Fleet. The terms were transmitted to Germany on 12 November 1918, instructing them to make the High Seas Fleet ready to sail by 18 November, or the Allies would occupy Heligoland. On the night of 15 November, Rear-Admiral Hugo Meurer, the representative of Admiral Franz von Hipper, met Admiral David Beatty aboard Beatty's flagship, HMS Queen Elizabeth. Beatty presented Meurer with the terms, which were expanded at a second meeting the following day. 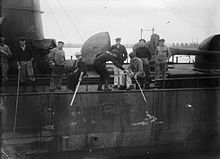 The U-boats were to surrender to Rear-Admiral Reginald Tyrwhitt at Harwich, under the supervision of the Harwich Force. The surface fleet was to sail to the Firth of Forth and surrender to Beatty. They would then be led to Scapa Flow and interned, pending the outcome of the peace negotiations. Meurer asked for an extension to the deadline, aware that the sailors were still in a mutinous mood (which earlier led to the Wilhelmshaven mutiny), and that the officers might have difficulty in getting them to obey orders. Meurer eventually signed the terms after midnight. The first craft to be surrendered were the U-boats, which began to arrive at Harwich on 20 November 1918; 176 were eventually handed over. Hipper refused to lead his fleet to the surrender, delegating the task to Rear-Admiral Ludwig von Reuter. The German fleet was met by the light cruiser Cardiff on the morning of 21 November, and led to the rendezvous with over 370 ships of the Grand Fleet and other allied navies. There were 70 German ships in total; the battleship König and the light cruiser Dresden had engine trouble and had to be left behind. The destroyer V30 struck a mine while crossing, and sank. The German flag will be hauled down at sunset today and will not be hoisted again without permission. The fleet was then moved between 25 and 27 November to Scapa Flow; the destroyers to Gutter Sound and the battleships and cruisers to the north and west of the island of Cava. Eventually, a total of 74 ships were interned there, König and Dresden having arrived on 6 December accompanied by the destroyer V129, which replaced the sunken V30. The last ship to arrive was the battleship Baden on 9 January 1919. Initially, the interned ships were guarded by the Battle Cruiser Force (later reduced to the Battle Cruiser Squadron), commanded in succession by Vice-Admiral Pakenham, Rear-Admiral Oliver and Rear-Admiral Keyes. On 1 May 1919, Vice-Admiral Leveson and the Second Battle Squadron of the Atlantic Fleet took over guard duties, and were succeeded on 18 May by Vice-Admiral Sir Sydney Fremantle and the First Battle Squadron. The naval historian Arthur Marder described the state of affairs on board the German ships during the internment as "one of complete demoralization". He identified four reasons that exacerbated the situation: lack of discipline, poor food, lack of recreation and slow postal service. The cumulative result of these problems created "indescribable filth in some of the ships". On 29 November the Second-in-Command of the Grand Fleet, Admiral Sir Charles Madden, wrote to his brother-in-law and former superior Lord Jellicoe that, "All proposed orders are considered and counter-signed by the men's committee before they are executed and then they are carried out as convenient". When visiting an interned ship the German officers were reported to have been "dumb with shame". Food was sent from Germany twice a month but was monotonous and not of good quality. Catching fish and seagulls provided a dietary supplement and some recreation. A large amount of brandy was also sent over. Recreation for the men was limited to their ships, as the British refused to allow any of the interned sailors to go ashore or visit any other German ships. British officers and men were only allowed to visit on official business. Outgoing post to Germany was censored from the beginning, and later incoming post also. German seamen were granted 300 cigarettes a month or 75 cigars. There were German doctors in the interned fleet but no dentists, and the British refused to provide dental care. Command of the interned ships was exercised through Rear-Admiral Reuter, flying his flag in the battleship Friedrich der Grosse. He had a British drifter at his disposal for visiting ships and issuing written orders on urgent business, and his staff was occasionally allowed to visit other ships to arrange repatriation of officers and men. Reuter, whose health was poor, requested that his flag be transferred to the light cruiser Emden on 25 March after he was repeatedly prevented from sleeping by the stomping on his cabin roof by a group of revolutionary sailors called the "Red Guard". Over seven months the number of men in his command was continually reduced from the 20,000 men who had sailed the ships over in November. 4,000 returned to Germany on 3 December, 6,000 on 6 December and 5,000 on 12 December, leaving 4,815, of whom approximately 100 were repatriated a month. Negotiations over the fate of the ships were under way at the Paris Peace Conference. The French and Italians each wanted a quarter of the ships. The British wanted them destroyed, since they knew that any redistribution would be detrimental to the proportional advantage in numbers they had compared to other navies. Under Article XXXI of the Armistice the Germans were not permitted to destroy their ships. Both Admirals Beatty and Madden had approved plans to seize the German ships in case scuttling was attempted; Admirals Keyes and Leveson recommended that the ships be seized anyway and the crews interned ashore at Nigg Island, but their suggestions were not taken up. Their concern was not without justification, for as early as January 1919, Reuter mentioned the possibility of scuttling the fleet to his chief of staff. Having learned of the possible terms of the Treaty of Versailles in May 1919, he began to prepare detailed plans to scuttle his ships. Admiral Erich Raeder later wrote that Reuter was informed that the fleet was to be scuttled at all costs. A further reduction of crews with the departure of two transports to Germany on 18 June 1919 meant that Reuter was left with reliable men to carry out preparations. On that day he sent out orders, paragraph 11 of which stated: "It is my intention to sink the ships only if the enemy should attempt to obtain possession of them without the assent of our government. Should our government agree in the peace to terms to the surrender of the ships, then the ships will be handed over, to the lasting disgrace of those who have placed us in this position." His orders were sent to the interned ships on 18 June. In the meantime the signing of the Treaty of Versailles was scheduled for noon on 21 June 1919. The First Battle Squadron prepared to board the German ships in force to check for signs that the fleet was preparing to scuttle. On 13 June Admiral Madden requested in person at the Admiralty a daily political appreciation from 17 June onwards so as to be prepared to take action, but as Madden related to Beatty shortly afterwards, "they had no reliable indication of the German attitude towards the peace terms". Admiral Fremantle submitted to Madden on 16 June a scheme for seizing the German ships at midnight of 21/22 June, after the treaty was meant to be signed. Madden approved the plan on 19 June, but only after he was informed that the deadline for signing the treaty was extended to 19:00 on 23 June and he neglected to officially inform Fremantle. News of the extension was seen by Fremantle in a newspaper on the same day and he assumed it to be true. He had been under orders from Madden for some time to exercise his battleships against torpedo attacks, which required good weather in order to recover the torpedoes. The weather on the night of 20 June was favourable so Fremantle ordered the First Battle Squadron to sea at 09:00 the next morning, 21 June. The operation to seize the German ships was postponed until the night of his squadron's return to Scapa Flow on 23 June, after the deadline to sign the treaty had expired. Fremantle later claimed that before he left Scapa he had unofficially informed Reuter that the armistice was still in effect. Around 10:00 a.m. on 21 June 1919, Reuter sent a flag signal ordering the fleet to stand by for the signal to scuttle. At about 11:20 the flag signal was sent: "To all Commanding Officers and the Leader of the Torpedo Boats. Paragraph Eleven of to-day's date. Acknowledge. Chief of the Interned Squadron." The signal was repeated by semaphore and searchlights. Scuttling began immediately: seacocks and flood valves were opened and internal water pipes smashed. Portholes had already been loosened, watertight doors and condenser covers left open, and in some ships holes had been bored through bulkheads, all to facilitate the spread of water once scuttling began. 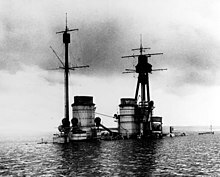 One German ship commander recorded that prior to 21 June, seacocks had been set on a hair turning and heavily lubricated, while large hammers had been placed besides valves. There was no noticeable effect until noon, when Friedrich der Grosse began to list heavily to starboard and all the ships hoisted the Imperial German Ensign at their mainmasts. The crews then began to abandon ship. The British naval forces left at Scapa Flow comprised three destroyers, one of which was under repair, seven trawlers and a number of drifters. 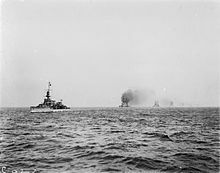 Fremantle started receiving news of the scuttling at 12:20 and cancelled his squadron's exercise at 12:35, steaming at full speed back to Scapa Flow. He and a division of ships arrived at 14:30 in time to see only the large ships still afloat. He had radioed ahead to order all available craft to prevent the German ships sinking or beach them. 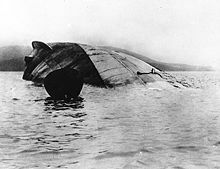 The last German ship to sink was the battlecruiser Hindenburg at 17:00, by which time fifteen capital ships were sunk, and only Baden survived. Four light cruisers and thirty-two destroyers were sunk. Nine Germans were shot and killed and about sixteen wounded aboard their lifeboats rowing towards land. During the afternoon, 1,774 Germans were picked up and transported by battleships of the First Battle Squadron to Invergordon. Fremantle had sent out a general order declaring that the Germans were to be treated as prisoners-of-war for having broken the armistice and they were destined for the prisoner-of-war camps at Nigg. Reuter and a number of his officers were brought onto the quarterdeck of HMS Revenge, where Fremantle – through an interpreter – denounced their actions as dishonourable while Reuter and his men looked on "with expressionless faces." Admiral Fremantle subsequently remarked privately, "I could not resist feeling some sympathy for von Reuter, who had preserved his dignity when placed against his will in a highly unpleasant and invidious position." I look upon the sinking of the German fleet as a real blessing. It disposes, once and for all, the thorny question of the redistribution of these ships. I rejoice. The stain of surrender has been wiped from the escutcheon of the German Fleet. The sinking of these ships has proved that the spirit of the fleet is not dead. This last act is true to the best traditions of the German Navy. 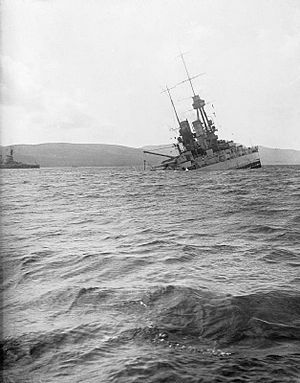 Of the 74 German ships at Scapa Flow, 15 of the 16 capital ships, 5 of the 8 cruisers, and 32 of the 50 destroyers were sunk. The remainder either remained afloat, or were towed to shallower waters and beached. The beached ships were later dispersed to the allied navies, but most of the sunken ships were initially left at the bottom of Scapa Flow, the cost of salvaging them being deemed to be not worth the potential returns, owing to the glut of scrap metal left after the end of the war, with plenty of obsolete warships having been broken up. After complaints from locals that the wrecks were a hazard to navigation, a salvage company was formed in 1923, which raised four of the sunken destroyers. At about this time, the entrepreneur Ernest Cox became involved. He bought 26 destroyers from the Admiralty for £250, as well as Seydlitz and Hindenburg. He began operations to refloat the destroyers using an old German dry dock he purchased and subsequently modified. He was able to lift 24 of his 26 destroyers over the next year and a half, after which he began work on the larger vessels. He developed a new salvage technique whereby divers patched the holes in the submerged hulls, and then pumped air into them so they would rise to the surface, where they could then be towed to the breakers. Using this technique, he refloated several of the ships. His methods were costly, however, and the final cost of raising Hindenburg ran to some £30,000. Industrial action and a coal strike in 1926 nearly brought operations to a halt, but Cox instead dug out the coal in the submerged Seydlitz, using it to power his machines until the end of the strike. Salvaging Seydlitz also proved difficult, as the ship sank again during the first attempt to raise her, wrecking most of the salvage equipment. Undaunted, Cox tried again, ordering that when she was next raised, news cameras would be there to capture him witnessing the moment. The plan nearly backfired when Seydlitz was accidentally refloated while Cox was holidaying in Switzerland. Cox told the workers to sink her again, then returned to Scotland to be present as Seydlitz was duly refloated a third time. Cox's company eventually raised 26 destroyers, two battlecruisers and five battleships. Cox sold his remaining interests to the Alloa Shipbreaking Company (later Metal Industries Group) and retired as the "man who bought a navy". The latter company went on to raise a further five cruisers, battlecruisers, and battleships, before the outbreak of the Second World War brought operations to a halt. The remaining wrecks lie in deeper waters, in depths up to 47 metres (154 ft), and there has been no economic incentive to attempt to raise them since. Minor salvage is still carried out to recover small pieces of steel. This low-background steel is used in the manufacture of radiation-sensitive devices, such as Geiger counters, as it is not contaminated with radioisotopes, having been produced prior to any chance of nuclear contamination. The seven wrecks that remain are scheduled under the Ancient Monuments and Archaeological Areas Act 1979. Divers are allowed to visit them but need a permit to do so. 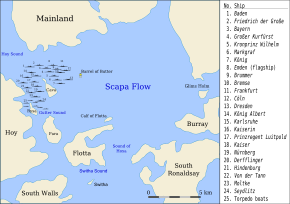 While the rebuilding of the German Army in the 1930s was based upon the combined myths of "invincibility on the battlefield" and the "stab in the back", the attitude and actions of the High Seas Fleet at Scapa Flow became a symbol of defiance for the new recruits and officers of the Kriegsmarine. The last living military witness to the scuttling of the fleet was Claude Choules, who died on 5 May 2011 aged 110. Choules was the last known living combat veteran of the First World War. An eyewitness account of the scuttling and the subsequent angry meeting between Reuter and Fremantle was published in 2015 by the family of Hugh David, who died in 1957. ^ a b c d e f g h i j k Massie. Castles of Steel. pp. 778–788. ^ a b van der Vat. Standard of Power. p. 135. ^ Marder. From the Dreadnought to Scapa Flow. V. p. 270. ^ Massie. Castles of Steel. p. 783. ^ a b Marder. From the Dreadnought to Scapa Flow. V. p. 273. ^ Marder. From the Dreadnought to Scapa Flow. V. pp. 271–272. ^ Quoted in Marder. From the Dreadnought to Scapa Flow. V. p. 271. ^ Marder. From the Dreadnought to Scapa Flow. V. p. 271. ^ a b c Massie. Castles of Steel. p. 785. ^ van der Vat. The Grand Scuttle. p. 138. ^ Marder. From the Dreadnought to Scapa Flow. V. p. 272. ^ Massie. Castles of Steel. p. 784. ^ Marder. From the Dreadnought to Scapa Flow. V. p. 274. ^ Reuter. Scapa Flow. p. 79. ^ Ruge. Scapa Flow 1919. pp. 130–133. ^ Raeder. My Life. p. 105. ^ a b c van der Vat. The Grand Scuttle. p. 167. ^ van der Vat. The Grand Scuttle. p. 168. ^ a b c van der Vat. The Grand Scuttle. p. 163. ^ van der Vat. The Grand Scuttle. p. 169. ^ Fremantle. My Naval Career. p. 276. ^ a b Marder. From the Dreadnought to Scapa Flow. V. p. 280. ^ a b c Massie. Castles of Steel. p. 787. ^ a b van der Vat. The Grand Scuttle. pp. 164–5. ^ van der Vat. The Grand Scuttle. p. 171. ^ Marder. From the Dreadnought to Scapa Flow. V. p. 281. ^ Marder. From the Dreadnought to Scapa Flow. V. p. 282. ^ Massie. Castles of Steel. p. 788. ^ Marder. From the Dreadnought to Scapa Flow. V. pp. 281–282. ^ a b c d e f g Fine. Lost on the Ocean Floor. pp. 130–138. ^ a b Butler. Distant Victory. p. 229. ^ Maritime and Coastguard Agency. "PROTECTED WRECKS IN THE UK: Wrecks designated as Maritime Scheduled Ancient Monuments". ^ Booth, Gary. "500 km by bike to demolish Albany". Navy News. Archived from the original on 3 February 2008. Retrieved 6 July 2007. ^ Marek Pruszewicz (19 June 2015). "WW1: The letter that reveals a brutal day at Scapa Flow". BBC Magazine. Retrieved 19 June 2015. ^ World War I Naval Combat. "List of Warships Scuttled at Scapa Flow". Fine, John Christopher (2004). Lost on the Ocean Floor: Diving the World's Ghost Ships. Naval Institute Press. ISBN 159114275X. Fremantle, Admiral Sir Sydney Robert (1949). My Naval Career: 1880–1928. Hutchinson & Co.
Marder, Arthur Jacob (1970). From the Dreadnought to Scapa Flow, The Royal Navy in the Fisher Era, 1904–1919: 1917: Victory and Aftermath. Volume V. London: Oxford University Press. ISBN 0192151878. Maritime and Coastguard Agency (2007). "Wrecks designated as Maritime Scheduled Ancient Monuments". MCA Receiver of Wreck. mcga.gov.uk. Retrieved 11 August 2008. Massie, Robert K. (2004). Castles of Steel: Britain, Germany, and the Winning of the Great War at Sea. New York: Ballantine Books. ISBN 0345408780. Reuter, Ludwig von (1940). Scapa Flow: The Greatest Scuttling of All Time. London: Hurst & Blackett Ltd.
von Ruge, Friedrich (1969). Scapa Flow 1919: Das Ende der deutschen Flotte (in German). East Berlin: Oldenburg. van der Vat, Dan (2000). Standard of Power: The Royal Navy in the Twentieth Century. London: Random House. ISBN 0712665358.
van der Vat, Dan (2007) . The Grand Scuttle: The Sinking of the German Fleet at Scapa Flow in 1919. Edinburgh: Birlinn Ltd. ISBN 9781843410386. Wikimedia Commons has media related to Scuttling of the German fleet at Scapa Flow.